When this movie came out, my sister mentioned that Gwenyth Paltrow "looked like crap" on the movie poster (she's the one on the bottom right). I am here to tell you that it is not just on the poster. She looks like that throughout the movie as well. 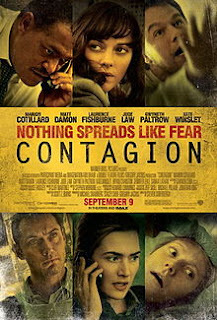 I understand that the movie is about people getting sick, but few things are less enticing than the image of someone spewing and hacking up all sorts of nastiness. Is this entertainment? Watching people get sick? I can see that every day on the MUNI. Oh, and the ending? Did you ever watch War of the Worlds, where everything is humming along and the director decided the movie was getting too long, so the movie ends abruptly with little explanation? Yep, it's kinda like that. But honestly, by then you won't even care. Final word: If I told you "no" for every person who lasted less than five minutes in this movie, would it convince you?